WhatsApp continues to be the most popular platform in Brazil, while Facebook falls, according to the latest data from the Reuters Institute for the Study of Journalism. WhatsApp registered a penetration amongst adults aged 18+ of 82.8% in 2018, after growing 22.1 percentage points (pp) since 2015. Facebook, however, has fallen continuously in this period, down 9.9pp to 74.6% this year. Despite this decline in Facebook use, YouTube was the only non-Facebook owned platform in the top five most used. It reached second-place after overtaking Facebook in 2017 and continued its growth this year, reaching 78.1%. Instagram has also seen strong growth since 2014, rising 30.4pp to reach just under half (47.8%). 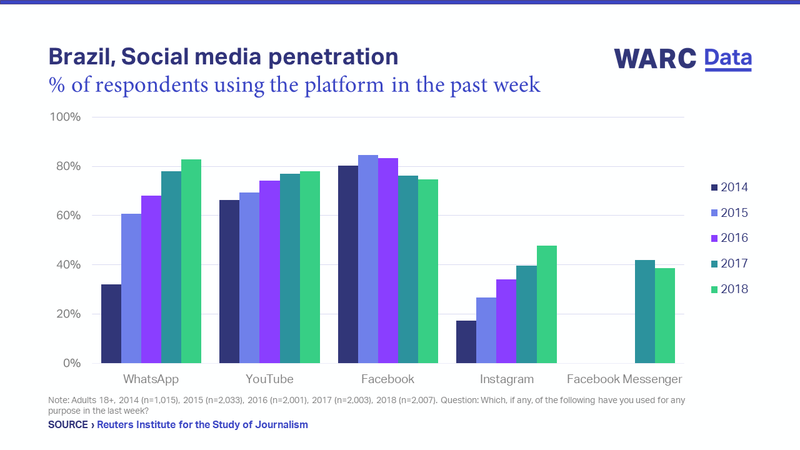 Alongside the Facebook platform, Facebook Messenger also saw a drop in penetration to under 40% in 2018. What do I get with WARC Data? The full Data is available to WARC subscribers only.